George Hogg (Jonathan Rhys Meyers) was born to privilege and graduated from Oxford University. Working as a reporter, Hogg becomes convinced that the next major war is brewing. Traveling to Japan, Hogg experiences a deep respect for the Japanese people. However, when he travels to Shanghai and maneuvers his way into a nearby town, he discovers the truth. Believing the Japanese are attempting to bring peace to the Chinese civil war between Mao’s Communists and Chiang Kai Shek’s Nationalists, he discovers the brutal “three all campaign” in which the Japanese kill all, burn all and destroy all. 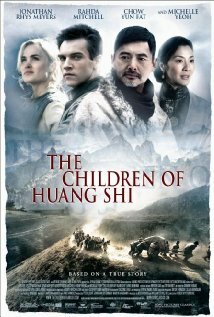 In a moment when his own life is about to be taken by the Japanese, Hogg is saved by Chen Hansbeng (Yun-Fat Chow). As a Communist commander, Chen takes Hogg under his wing and introduces him to an American woman named Lee Pearson (Radha Mitchell). It is Lee’s recommendation that Hogg be sent to a school of young boys in Shuangshipu to recuperate. What Hogg doesn’t know is that she is sending him there to save both the boys and himself. Not only does he find his true calling, but he also finds his courage. As the war escalates, Hogg creates an impossible plan which involves walking the boys over 700 miles through mountain passes and winter storms to a new home in Shandon, far away from the fighting. Miraculously he succeeds. During the closing credits, four brothers that Hogg took in during an attack give their own testimonies of Hogg’s love and care. Hogg’s shortened life due to his compassion for the boys makes us aware that purposeful living is not based on length of life or even unusual skill, but rather the sacrificial expression of love for others. The “Children of the Silk Road” is a vibrant though violent reminder of this truth. The historical evidence as recounted by the reporter who uncovered the story and wrote the original script, James MacManus, presents a more adventurous person than the one in the film (http://www.timesonline.co.uk/tol/news/world/asia/china/article1362720.ece). Why do you think the later screenwriters and directors chose to rewrite the history to make a more romantic tale? In John’s account of Jesus’ life, he quotes Jesus saying “My command is this: Love each other as I have loved you. Greater love has no one than this, that he lay down his life for his friends.” (15:12,13) Would you be willing to give your life to care for orphaned children when it most probably will cost you your life? Where do you think Hogg’s compassion came from? After surviving so much danger, it seems unfair that Hogg would die because of a simple injury. In the film it was a cut on his hand, while in real life it was a cut on his foot. How do you deal with such unjust outcomes? Posted on June 1, 2011 by Cinema In Focus and filed under 3 STARS, POWERFUL and tagged 3 STARS POWERFUL 2008 R RATED DRAMA WAR.